Who gets to decide how language is used? 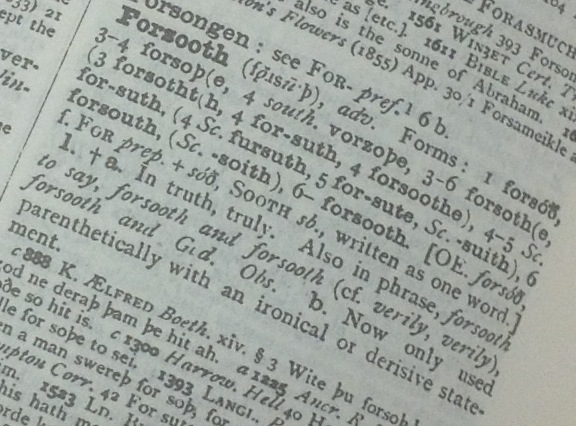 Few people use “forsooth” anymore. It’s marked “Obs.” in the Oxford English Dictionary. Recently during a discussion about standard English, usage manuals and stylebooks, I was asked, “Who gets to decide?” My answer was, “We all do.” As users of the language, we are the ones who ultimately determine the direction of our language: the fate of words old and new, changes in meanings, and addition or subtraction of grammatical constructions. Of course, it’s not as simple as a few people saying, “Now X will mean B instead of A.” Change rarely happens from the top down; it’s an organic process that takes time. In the past, given enough time, one language would gradually split into new ones that were no longer mutually intelligible. It’ll be interesting for linguists of the future to study the effects of standardized usage, high literacy rates and mass media on language change. As it is now, words that most people no longer use eventually get labeled “archaic” or “obsolete” and fade from the language. New words appear to describe new concepts or technologies (or newly discovered old things, like “Nasutoceratops”). New words, phrases, usages and meanings are often derided as “vogue” or “jargon” when they first appear. If people find them useful, they stick around, no matter who tries to banish them — many style and usage guides banned “host” as a verb for a long time; their preferred “play host to” sounds stuffy and wordy today. But if people don’t keep using them, they leave. Forsooth, I won’t be sad if I never see the words “upsurge” or “under-retailed” again, but I’m not the only one with a say in the matter. Beyond words, grammatical structures also can and do change. Way back, English used to have cases (like modern German and many other languages), which marked a word’s function in the sentence. Now case is all but lost; only pronouns — and only some of those — retain different subject/object/possessive forms (he/him/his), and nouns retain case only for possessives (Sue vs. Sue’s). A couple of contentious usage issues in English today — the decline of “whom” and the use of “they” as a singular (both of which I plan to discuss in depth later) — are grammatical shifts that haven’t finished shifting yet. Language books, writing guides and usage manuals, though, wait for a shift to be more or less complete before accepting it. So, while the users of the language get to decide how the language is used, the deciders for what is considered “standard” give things a while to settle in. The better usage manuals do not treat English as “set in stone” but recognize that at any given time, there will be things in flux. That’s one of the (many) reasons my go-to usage guide is Garner’s Modern American Usage: it has the Language-Change Index, which measures how widely accepted certain usages are in five categories. Stage 1 is “rejected”; Stage 2 is “widely shunned”; Stage 3 is “widespread but …”); Stage 4 is “ubiquitous but …”); and Stage 5 is “fully accepted.” The index lets writers and editors know where a changing usage is in terms of acceptability, and then lets them decide, based on their tone and audience, whether they want to leave it or change it. And increased use of new forms will likely bump them up the index for the next edition. In business, “But that’s the way we’ve always done it” is considered a poor reason for resisting change. Likewise, in language, “But that’s the way we’ve always said it” doesn’t mean we have to keep saying it that way forever.